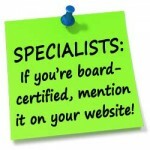 You do not need to be board-certified to have an IDA specialist website. Your website will not include any mention of board certification unless you insert that language yourself. But if you are board-certified in that specialty, it’s a good choice to mention that. I’m going to show you where you can do that. Where should you put your board certification? You can also include it in your doctor profile by mentioning your certification in your Philosophy statement. Another good place is the “Services & Benefits” list. Again, just include “Board-Certified Orthodontist” as one of these bullet points. Finally, you can mention it again in the footer on all pages of your website. Please note: you should only do this if you are board-certified in your state for the same specialty as your website.